After the Saint had spoken, they fell silent, except for one girl, who was very impudent. She retorted arrogantly: "You false monks fornicate yourselves; and will you teach us, O hypocrite? Who don't you go your own way? Why do you care about us, since we are of no relation to you?" Then the righteous man answered her: "Blessed be God Who works towards the advantage of all! May He punish your foolishness and unbridled tongue, that you may become to the others a model of morality!" Thus he said and left. That evening the venerable man took shelter with a friend of the monastics. However, the wretched girl, before she reached her father's house, became demonized, foaming at the mouth and kicking, Her parents were distraught and could not understand how this trouble had come about. But one of the young woman's companions related to them the matter in detail. Wherefore, weeping, they ran and inquired throughout the city for the ascetic. They found the house where he was staying and fell at his feet, entreating him to forgive and not to bear resentment towards their ignorant daughter. The Saint, never one to remember wrongs, then blessed the girl, and her soul was taught chastity, and her body was cured as well. Out of fear, she chose not to marry, and ended her life in temperance. There was a monk at Beroia who knew letters slightly. It so happened that a book on divination came into his hands, and he read it to test it a little, and thereby invoked the demons. One particular night, as he was sleeping, he saw a giant Ethiopian in a dream, who said to him: "Because you have called upon me, I have come. If you bow before me, I will do what you ask!" 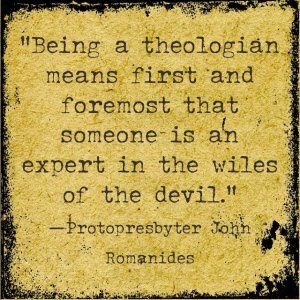 Now the monk recognized that this was the devil, and said to him: "I worship the Lord God, and Him only I serve!" Then in anger the demon smote him across the face, and said: "Since you will not fall down and worship me, why did you summon me?" Then, on account of the pain, the monk awoke shouting loudly and cried out. Others gathered and saw his jaw and cheek were swollen and bruised; a very strange sight. In a few days it swelled further and blackened even worse, to such a degree that his eyes could not be seen at all. Therefore, they sent a message to the Saint to come and see this. When the holy Dionysios saw him, he made a prayer to the Lord and chanted the Supplication Canon to the Theotokos. He anointed him with holy oil, whereby he recovered and glorified the Lord. A widow named Zoe had two sons, Demetrios and Arsenios. A dreadful illness came upon the second son, causing his face to swell, which terribly distressed his mother. Demetrios then said to her: "If I do not take my brother to Olympus where Abba Dionysios is, he will never be cured!" She said to him: "Go then, my son!" The two brothers went to the Saint, and after they told him of the entire matter, the elder received them gladly and read a prayer over the sick one and anointed his face with oil. In a few days Arsenios recovered. 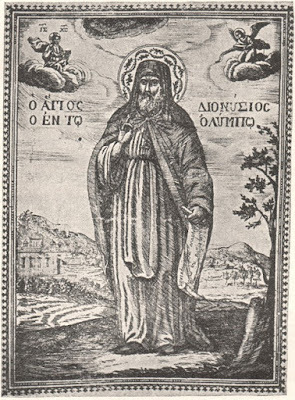 Arsenios sojourned there for a little while and was so captivated with the life of the monastics that he resolved to become a monk. He, in turn, consulted Demetrios about this matter and encouraged him to do the same; the latter promised to become one also, but later on. Arsenios was then garbed in the cassock. Demetrios returned to his house and related to his mother what occurred. She then became so distraught and pined away. A certain evil woman advised Zoe to pay a sorceress to force Arsenios out of the monastery. The sorceress, in practicing her evil craft, conjured the chief of the demons, whom she sent to Olympus to drive Arsenios out of the monastery. But the demon was unable to enter the monastery, for divine grace kept him at bay. Therefore, the evil spirit returned to Zoe humiliated, having had no success. He then seized her by the throat and beat her, saying: "Why did you send me to the ascetic and servant of God, whom I cannot approach? Now I will give you your just reward!" As the demon said these things, he repeatedly kicked and struck Zoe, causing her to scream. Her neighbors gathered around and asked her the reason for the commotion, and she confessed the truth. Then she sent Demetrios to call the Saint and, immediately, as he approached and uttered a prayer on her behalf before the Lord, she was restored whole and sound. Later, she so loved the schema of the monks, that she too became a monastic, as well as Demetrios. In another village, called Isvoron, there dwelt a man whose daughter was disturbed by a demon. Her father felt more pain in his heart than did his daughter. He tried to heal his daughter through any means, but was unable. At last he remembered the Saint and went to him. Falling before his feet, he besought him to heal her for the Lord's sake. The holy man did not hesitate, but went to the disturbed woman. As he prayed, the evil demon departed at once, as darkness is banished by light. 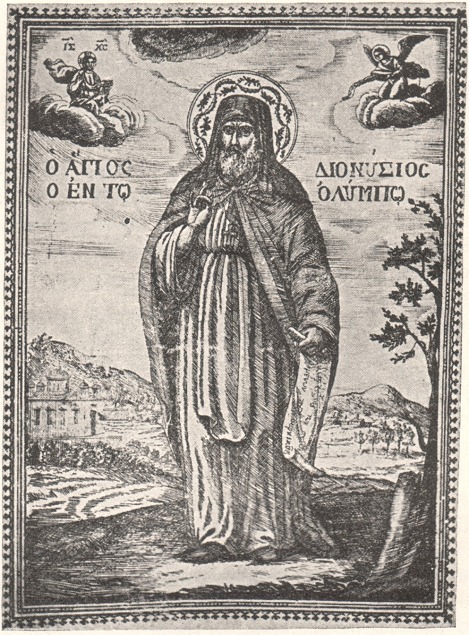 From the book New Paradise, "Life of Saint Dionysios of Olympus" (Venice, 1641).